Frogs are common throughout the world. There are over 85 species here in the United States. 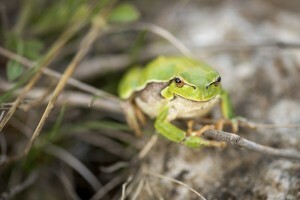 The most common species include tree frogs, toads and bullfrogs. Tree frogs and bullfrogs tend to congregate where there is adequate water for their survival and reproduction. Toads are more prevalent where its dry but can live most anywhere. 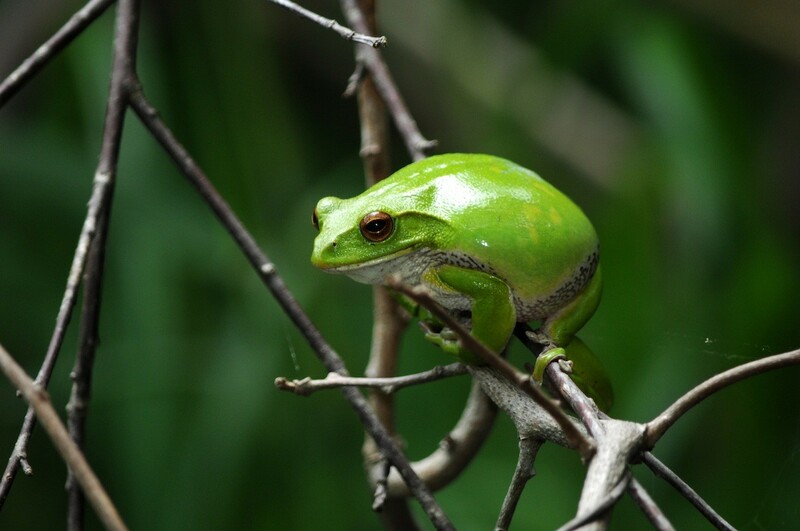 Though tree frogs are considered beneficial because they eat insects, in many cases a local population can explode and in turn become a nuisance. Tree frogs can become a problem for many reasons. Tree frogs mostly live in trees but will find their way onto homes and once on the structure can in turn cause all kinds of issues. They’ll typically nest and hide behind shutters, under siding and anywhere away from sunlight during the day. At night they will emerge and feed. The problem with having tree frogs on your home is that they tend to make a mess. Their droppings will quickly accumulate below where they are nesting. Tree frog droppings look a lot like rat droppings and can easily fool people into believing they have a rodent problem. If you are finding these droppings along window sills or below sections of your home and suspect tree frogs are to blame, do a thorough inspection of the area. Tree frogs will come out at night to feed but by daybreak will crawl behind shutters and into cracks and crevices attempting to avoid the sun. Tree frogs like these areas to be well shaded, tight and compressed. Window frames, siding, rain gutters, overhanging bricks and facia boards all present prime tree frog nest sites. Any kind of small gap in these locations are what the tree frogs like. Treating for tree frogs is easy. We have a repellent spray which works immediately. Treatments typically last 3-4 weeks and can be made to the side of the home, plants and shrubs where they like to hide. If you have activity on the home, you’ll want to the infested areas first using PEST RID SPRAY. One quart can cover up to 125 sq/ft and can be sprayed on siding, shutters, gutters, downspouts and pretty much any where you see activity and want them to leave. 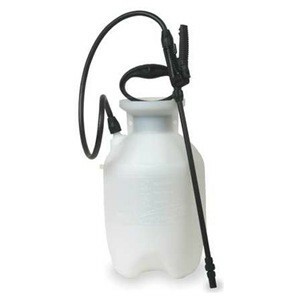 The red quart size comes with a spray nozzle so you can use it to make applications. If you have a lot of area to spray, get a good PUMP SPRAYER to make the application. If you have high areas to treat, a TROMBONE SPRAYER might be needed. 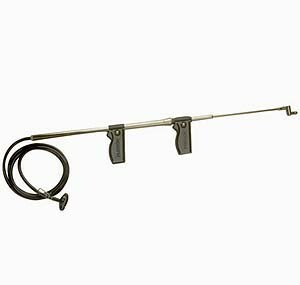 It can reach up 30 feet making it ideally suited for hard to reach siding or tree tops. Now if you have a lot of trees to treat, consider a fogging machine. We carry several that put out a fine mist and using a mist will enable you to treat a large area quickly and efficiently. Basically using a mist allows you to cover about 10 times as much area compared to using a liquid. In this case, a gallon can cover up to 500 sq/ft when sprayed as a liquid. But when used in a fogging machine, a gallon can cover up to 10,000 sq/ft. No doubt mist blowing is very effective for this task because it will use less chemical, saturate the foliage much better compared to a liquid spray and in most cases, reach higher heights. Here are a few to consider and remember, after 1-2 seasons, any of these machines will effectively pay for themselves by saving you time and chemical use. So for small yards 5,000 sq/ft or less, the MINI FOGGER will suffice. It features a 32 oz holding tank and is lightweight. 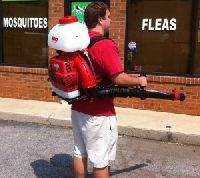 The mini fogger will spray out 20-25 feet so its plenty powerful to handle small yards with limited tree height. For areas up to 1 acre, the FM6309 is better suited. It has a 1 gallon holding tank and can spray out 30-40 feet making it better suited for larger lots. For treating lots 1 acre or more, the SOLO MIST BLOWER is best suited. It can spray out 50 feet and more so you can effectively treat tall trees. If you’re finding tree frogs in the home, install FROG TRAPS. Set them out along ledges, around doors, aside baseboards and other areas where tree frogs are landing and roosting. These traps use special lures which combine ground up insects and pheromones tree frogs naturally target. Once set out, the traps will naturally pique the curiosity of any nearby frogs and they’ll get stuck in the glue when they enter. If you don’t wish to kill the tree frogs caught, they can be removed by rubbing vegetable oil where they’re stuck and it will release them unharmed. Once detached you can take them away from your property to relocate somewhere off your land. Take them at least 2 miles away to insure they don’t return. Tree frogs can become a nuisance around the home. Though not commonly though of as a pest, treefrog control may be needed when populations are left to grow with no natural predators. 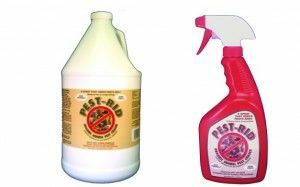 If you have a local population on your home making a mess and want to get the treefrogs to relocate, start applying some of the products we have listed above. Within a week or two you’ll notice less activity and if you treat every month or so, they will stay away for good. I have a 3 thousand gallon fresh water pond with Koi and goldfish. It is made from dry stacked limestone rocks. Problem is we get overrun with both toads and tree frogs. There is millions of areas for them to hide in the cracks. During mating season it gets sooooo load we cannot enjoy or sunroom and must keep all windows closed. What can I do to repel these little critters? Did you review our article above? In the article we list several products that can help. And for your situation, I’m sure the Pest Rid Spray is the way to go but if the pond is above ground, you might be able to use the Diatomaceous Earth too. Now what I mean here is that it’s unclear if the stacked limestone you mention is stacked from the ground level up (which I think it is) so if this is the case, then the pond is essentially “above ground”. And if that’s true, then the sides of the limestone rocks are exposed and would be a great place for frogs and other pests to hide. Now if this is the way the pond is constructed, with it’s sides in the air and not “in the ground” like a real in ground pool, then dusting the sides first with lots of DE dust would be the first way to proceed first. I’d use the DE dust by blowing it into every nook and crevice of the rocks using a hand duster. After the treatment, I’d let it sit for 1-2 days during which time the dust will be cleansing the stones of all kinds of pests and critters that no doubt will be attracting the frogs in the first place. And after the 2 days pass, I’d hose it all off, let it dry, and then apply a good coating of Pest Rid Spray over the top. Lastly, I’d treat as much of the yard as is needed with the Pest Rid as well focusing on all the common tree frog haunts. The bottom line is that where Pest Rid is applied, the frogs will avoid. And I expect you’ll need to do this 1-2 a month for the first few months but once they’re gone, less frequently. And if the area is relatively flat, the Pest Rid Granules should also be employed. Please be sure to show your support for our business by purchasing the items we recommend from the links provided. Remember, this is the only way we can stay around and keep this valuable web site up and running. Thanks for your business! I DO have an in ground pond with flagstone just stake around for looks. There are two, one that flows into another. What is your suggestion for this type of pond? Still the spray? When lawn service comes, we either have them use granular type products and we cover the ponds with tarps JUST in case one bounces in….which has happened…so with experience of having my own for many years and now having built a few for my clients and having to maintain them….this has been a BIG problem for us. NOT just for ponds…but our swimming pools as well. Which leads me to my next question….IF spray over should happen…is the product you recommend going to change the water chemistry in the swimming pools like other products have…e.g. Fertilizer. Thank you. No doubt fertilizer and many insecticides can either be hazardous to aquatic life or impact the balance of the water (ph). This is why its generally best to not use such materials within 25-50 feet of ponds, streams, lakes, etc. This is especially smart when runoff is a concern. That being said, there are some products which can be safely used in these sensitive areas. Pest Rid is such a product. Made with federally exempt actives, even if some of the granules or spray were to “runoff” or “drift” into the pond during treatment, this over spray would have no significant impact. So to answer your question; Pest Rid Granules and Pest Rid Spray will not change the water chemistry of swimming pools or ponds when used properly around the yard. I have had a hurricane shutter business for 20 years. My biggest problem has been frogs getting stuck in the shutters and jamming them. I would like to find an environmentally friendly chemical product to prevent the frogs from nesting in the shutters. Please email me at your earliest convenience to discuss any options. This is an easy one. Get the Pest Rid Spray and start by using it on a problematic shutter installation you know exists. I’m certain you’ll see positive results that will last at least 1-2 months. Now will it be a permanent solution? Probably not. But maybe you can have your customers treat during the active season every 1-2 months to make sure the frogs don’t return. Alternatively, you may opt to offer a service where you come around and do the application for them every 1-2 months. Either way, I’m sure this will do the job. E-mail me your number if you’d care to discuss this matter in more detail and I can give you a call sometime.